We are passionate about sailing and sharing the heritage of our traditional wooden Caribbean trading vessel ~ Good Expectation ~ one of the few remaining Carriacou Sloops of old. We offer two options for charters either a private charter, where you pay for the boat and then up to six persons are all included for your charter. Then our group charter is where you pay per person and we seek others to match with you. 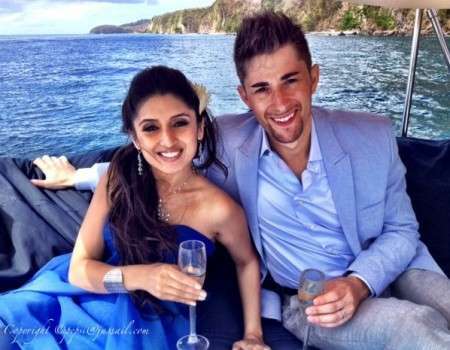 The group charters need a minimum of four persons to run, so if you’re a couple we need one other couple to match you with. The further ahead you book the better chance we have of matching you with someone else. Our charters are booked on a first come first served basis, so if you have a specific day you want to sail on or are only on island for a short period then its best to book ahead of time as much as possible. 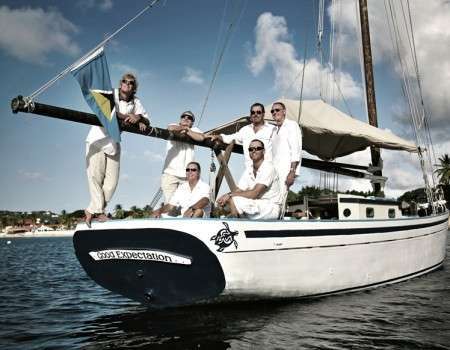 If you have any questions its best to drop us a line at sail@jussail.com and we will be happy to be of assistance. We look forward to hearing from you! Our goal is to always offer an authentic laidback sailing experience and our sunset cruise is the epitome of a truly laidback sail! 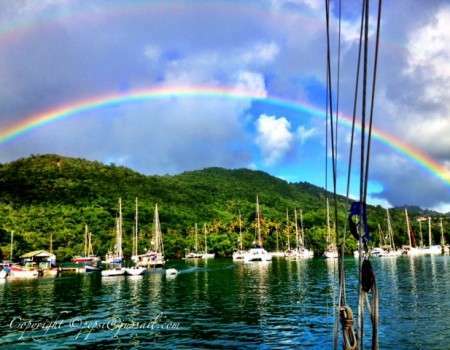 As soon as we get out of the entrance of the Rodney Bay Marina its off with the engine and hoist the jib, letting the breeze take us on a tranquil sail across Rodney Bay, past historic Pigeon Island and South past Barrel O Beef Islet towards and into Choc Bay. This is far from a party cruise with thumping music… The only sounds are the lapping of the water on the hull and the wind in the sail, as you sit back and take in the stunning views whilst sipping a glass of our favourite Prosecco. Includes ~ local snacks, soft and premium alcoholic drinks including a bottle of our favourite Prosecco. 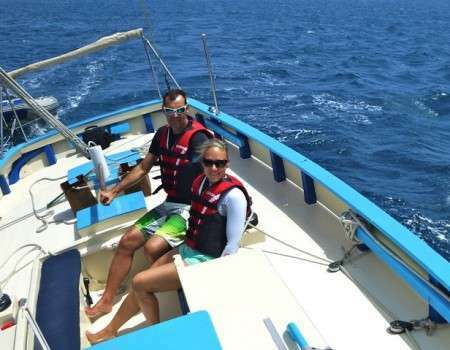 This is our introductory sailing experience for those looking to get out on the Caribbean Sea whilst in St Lucia without it taking up their day. During the two hour session you will have time to get as much or as little involved in the sailing as you wish ~ take the helm, help to trim the sails and pull on a few lines ~ or you can kick back in our jumbo deck beanbags or comfortable seats with a fresh local juice, coconut water or alcoholic beverage of your choice. 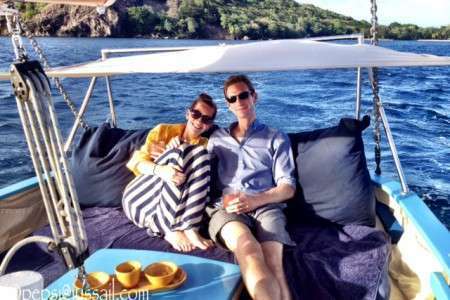 Included in the experience are local snacks and our full range of drinks, which you can enjoy whilst you soak up the romantic atmosphere of the boat and the stunning views of St Lucia’s coastline. 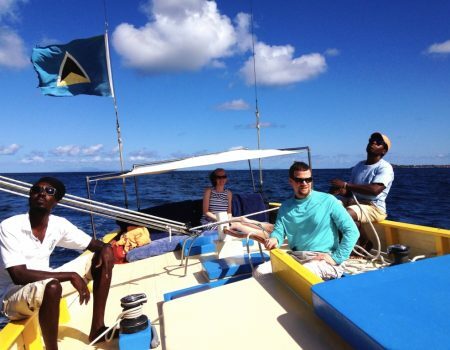 Half Day Charter – Our most popular offering! 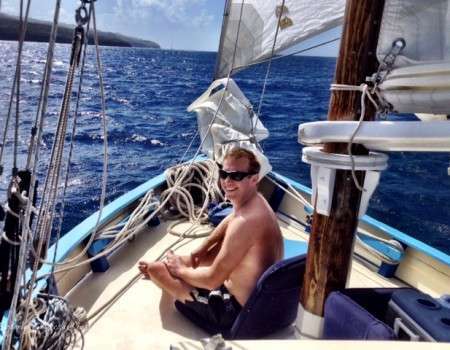 Our Half Day sailing charter is ideal for those wanting to venture a bit further afield. When leaving from Rodney Bay Marina we will sail South towards Vigie peninsula & Port Castries before heading North to a secluded cove for swimming/snorkeling and relaxing on deck to enjoy the setting sun. We will keep our eyes peeled for turtle spotting in Choc Bay and during the spring migration (Feb-March) for Humpback whales. 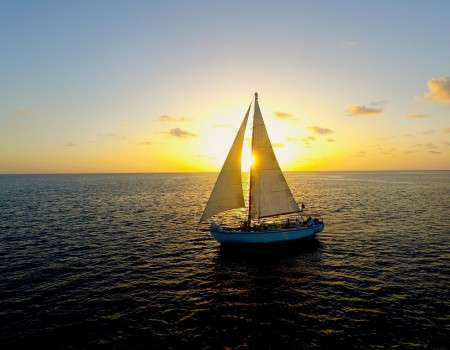 One of the reasons why our half day is so popular is that it includes a little bit of everything that we have to offer including sailing, snorkeling and relaxing on deck at sunset all within a 4hr duration, so you can still enjoy a full morning and lunch at your hotel. Included in the experience are gourmet snacks, dips, fruit platter, sourced where possible from local producers and local fruit cake, fresh local juices, coconut water, sodas, beer, our famous rum punch and the Jus’ Sail Sunchaser cocktail plus an array of premium rums. This option is perfect for those who like to get out and about earlier in the day and can then be back on shore in time for lunch, having enjoyed an exciting and laidback morning session on the water. 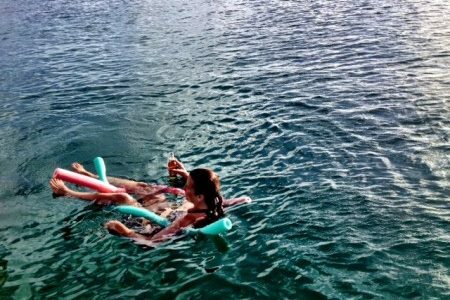 This charter includes time for sailing and a stop in our favourite secluded cove for swimming/snorkeling and relaxing on deck to enjoy the morning sun. Like our half day we will keep our eyes peeled for turtle spotting in Choc Bay and during the spring migration (Feb-March) for Humpback whales. 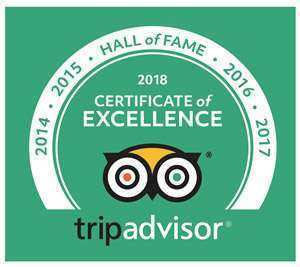 Included in the experience are gourmet snacks, dips, fruit, sourced where possible from local producers and local fruit cake, fresh local juices, coconut water, sodas, beer, our famous rum punch plus an array of premium rums. Sailing time is 9am to 12 noon. For those of you looking to travel a little further a field on your day on the water, this is the choice for you! A full eight hours of activities as energetic or relaxed as you wish them to be. We start at 10 to 10:30am (depending on season) so you can still enjoy a leisurely breakfast at your hotel and get you back to the dock a little after sunset giving you time to get back and clean up before your evening meal. Our destination is the iconic Marigot Bay, where we will stop for lunch at the top rated Masala Bay Restaurant that overlooks Marigot’s stunning natural harbour. There is time to explore the marina, poke around the shops and relax on deck with a drink whilst you soak up the laidback ambiance of this delightful hurricane hole. 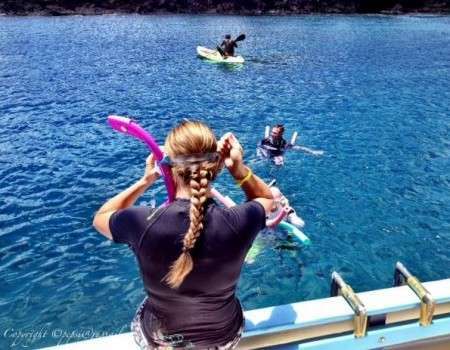 After lunch we will sail back up the coast and enjoy a stop in a secluded cove for swimming, snorkeling and relaxing on deck with a drink in hand to enjoy the sunset before making our way back to the dock. Charter includes ~ Lunch, soft and premium alcoholic beverages, snacks and tax. 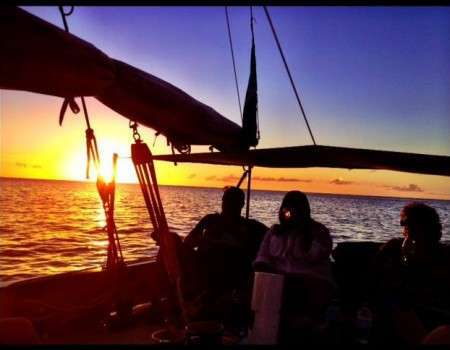 The Jus’ Sail Rum Tasting Sunset Cruise – Award winning rums, a wooden boat and a Caribbean Sunset! Why Not? 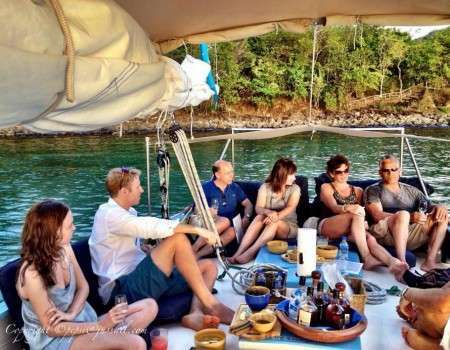 Proving very popular with RUM LOVERS is is our exclusive Premium Rum Tasting Sunset Cruise! St Lucia Distillers are dedicated to the fine art of blending some of the World’s most iconic, multi-award winning, premium & super premium rums. We think there’s no better way to sample them all than jumping aboard our beautiful local sloop for a couple of hours at the end of another tropical day. 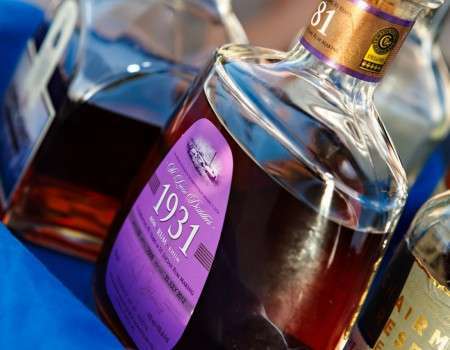 During which time you can immerse yourself in the world of top end rums, soaking up the ambiance aboard & returning to shore with a warm glow in your tummy & a little wiser about the centuries old culture of rum running under sail between the islands. Includes premium rum samples, snack platters & other drinks ~ sodas, fruit juice, coconut water, beer, water. Sailing is subject to the weather conditions. 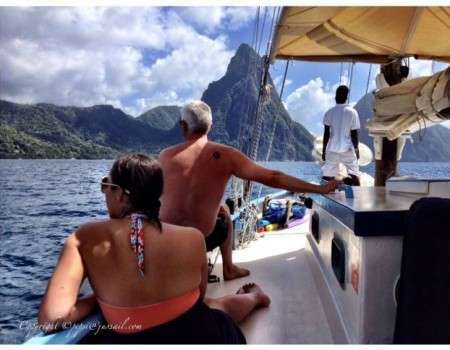 If you are lucky enough to be splitting your stay in St Lucia between two hotels then why not choose Jus’ Sail to transfer you between your hotel in the Rodney Bay area and Soufriere? Popular twin stays include Cap Maison and Ladera’s Peak to Beach package and over the years we have transferred a number of guests between hotels in the North such as Cap Maison, Landings, Sandals, East Winds, Calabash Cove and Le Sport with hotels in the South such as Ladera, Sugar Beach, Anse Chastanet and Jade Mountain. 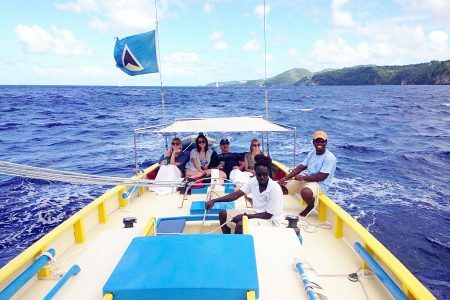 A private half day charter with Jus’ Sail is the perfect way to effortlessly transit between one hotel and another and capture that iconic Pitons from the sea image which adorns so much St Lucian promotional literature! Also as our vessel is a converted trading boat we have plenty of space down below to store your luggage as well. Contact us on sail@jussail.com for details and availability. Propose, get married, scatter loved ones ashes- special requests!